Summer Camp 2019 — Afterschool Art and More! Click on the photo below to visit our camp gallery! Our gentle, step-by-step method of instruction is designed to help children bloom creatively while learning the fundamentals of art & writing in a calm, friendly environment; free of judgment and competition. Our camps will take place in Ascension Hall, located inside the church. Conveniently located in Southern Village, just five minutes south of Chapel Hill off 15-501, this location offers easy parking, ample bathrooms, water fountains, a spacious classroom, a kitchen and a lovely playground. Christ United Methodist Church is located at 800 Market Street, Chapel Hill,NC 27516. Writing Theme: Mystery - Campers will sharpen their own detective skills as they learn the keys to writing a mystery. Art Theme: Savvy Sleuths - Who done it?! Campers will spend this week with the ASaM Detective Unit learning the art of investigation. We’ll study fingerprints, analyze handwriting, experiment with invisible ink paintings, test our observation skills and more! Sign up now before available seats disappear. Writing Theme: Myth - Why is the Earth round and not cubed? Is there a god of laughter? While exploring Greek Mythology, campers will create their own questions and then write comical or courageous myths to answer them! Art Theme: Greek Mythology - Ancient myths will come to life as campers explore the history of this fascinating culture. Fun arts and crafts projects will help campers create modern versions of ancient classics. Veni, Vidi, Vici! Writing Theme: Personal Narrative - Talkative campers full of stories will love this week’s writing camp. We’ll learn how to keep readers on edge and engaged telling our own true, and created, stories. Art Theme: Dinosaur Dig - This week will take campers even further back in time to investigate the wild, awesome world of dinosaurs. Dig? Writing Theme: Poetry - Campers will discover energetic elements of poetry while promoting their up and coming lemonade stand! Art Theme: Lemonade Stand - Campers will learn how to create and run a lemonade stand from the ground up that fosters teamwork and promotes an entrepreneurial spirit. Proceeds will be divvied up amongst the campers at the end of camp on Friday! Cover to cover, campers during this week will learn how to write and illustrate their very own book about wildcats. With our guidance, campers will focus on daily wildcat illustrations and writing genres. This is our fourth year for this camp. Every year offers new material! New campers will love learning to create a book from scratch and returning campers will enjoy learning more about these wild and wonderful animals. This camp includes a field trip to the Carolina Tiger Rescue for a tour to see the animals they are learning about. This is a full day camp, M-F, only. No discounts apply to this camp week. Writing Theme: Letter Writing - Campers will explore different reasons to write a letter and revive the heart-warming gesture of sending one! This week they’ll get to surprise family and friends with their own words. All postage included! 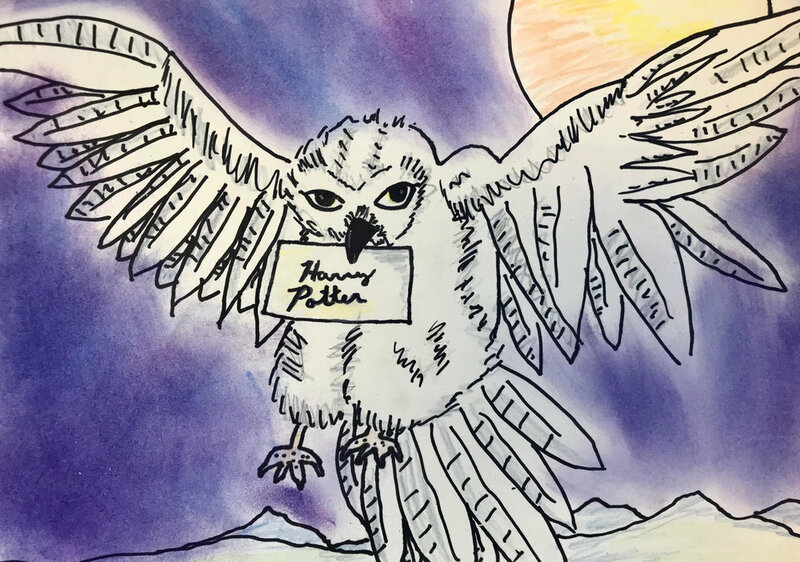 Art Theme: Masters Of Art - Campers this week will delve into art history, hone observation skills and learn a secret that the great masters of art knew - how to find creative inspiration in daily life. We will interpret the works of O’Keeffe, Warhol, Khalo, Thiebaud, Hokusai…to name a few! Campers will use a variety of fine art materials every day, including painting in acrylic on canvas. Writing Theme: Science Fiction - Trying to keep cool this summer we will create our own Arctic Adventures with Sci-Fi scenarios. Art Theme: Arctic Adventure - Polar bears, narwhals, seals, walruses, whales, Inuit fisherman and more will keep campers happily chillin’ this week as we learn about and imagine exploring this important area of our world, north of the arctic circle. Cover to cover, campers during this week will learn how to write and illustrate their very own book about our beloved, local, family owned dairy - Maple View Farm!! With our guidance, each day campers will focus on dairy farm related illustrations and writing genres. This camp includes a field trip to the Maple View Farm Ice Cream Shop to sample their highly acclaimed ice cream made with milk from MVF cows! This is a full day camp, M-F, only. Discounts DO apply to this week! You may need one more day of camp! Children ages 5-11 and mentors ages 12-14 are invited to keep the magic of summer going for one more day. As always, we offer great discounts for multiple children in the same camp so this is a great opportunity for siblings and friends to enjoy one last hurrah together before school starts. Our goal is to model and foster positive, respectful behavior in a fun, relaxed and creative camp setting. We expect everyone participating in our camps to contribute towards making each week a success. Please review our behavioral expectations.